Travel north from Terrinoth, across the Sea of White Fangs, and discover the snow-covered land of Isheim, a place of frozen beauty and sudden savagery. There, those hardy souls who call that place home whisper fearfully of an impending doom. The winds grow ever colder, the storms more ominous, and the creatures of the wild more dangerous. An ancient evil has emerged from a long sleep and threatens to consume the land. Now is the time for bold hearts to stand against the impending disaster. Now is the time to venture into the untamed wilds of Isheim and endure the ice, snow, and bitter winds. Now is the time to recover legendary items of power and wield them in the defense of warmth and hope's last glimmers. Vicious beasts lie in wait to cut short the journeys of unwary travelers, but beneath the ice also lies the secret of the land's ruinous mystery. Can you piece together the clues and rumors, and stop the approaching blight? Are you brave enough to pit your wits, your strength, and your will to survive against the unforgiving Frozen Wastes? The Frozen Wastes features a new, beautifully rendered board overlay, 110 new cards, six new Hero figures, and winter survival gear. The ever-changing weather is represented by new rules for the harsh conditions, weather tiles, frost counters, and white death counters. Will you defeat the rising darkness, or perish in the Frozen Wastes? This expansion/addition to Runebound brings a whole new game board full of snow and ice. This means that you need the right equipment! Without it moving becomes difficult. So difficult in fact that sometimes you can’t move at all. This makes it very hard to battle the monsters in the field (which are again divided in green, yellow and red) or find the clues you need to rescue the princess (captured by an evil being). The encounters in this expansion are somewhat easier than in the base game. Where yellow encounters could outright kill you and red encounters were saved to the very last in Runebound: The Frozen Wastes the encounters are not so steep as before. So you may level a little quicker, provided you can get to the encounters. A problem is moving around as mentioned previously. You throw dice to move through terrain that has a matching symbol. However, because of the ice age you may lose some or all of your dice to throw with. So sometimes you just have to stay on your spot and don’t do anything. The extra items are nice and overall this expansion plays like the previous edition. The main drawback is movement (or lack of it), with which you have to deal. Also the flavor of the game is strange. They mixed a SF-theme into the fantasy to explain where the ‘evil’ being came from. I thought this a bit superfluous. Just stick to the fantasy game, guys! 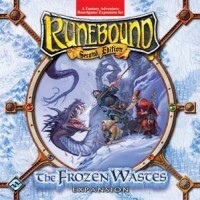 Add a Review for "Runebound: The Frozen Wastes"